In the last few months, my group chat has exploded with conversations about what we're all eating for dinner, and what meal delivery service we're using to do it. I have long been a DIY meal-prep convert, dutifully heading to Coles on a Sunday afternoon and prepping bulk batches of fish with roasted vegetables to get me through the work week. 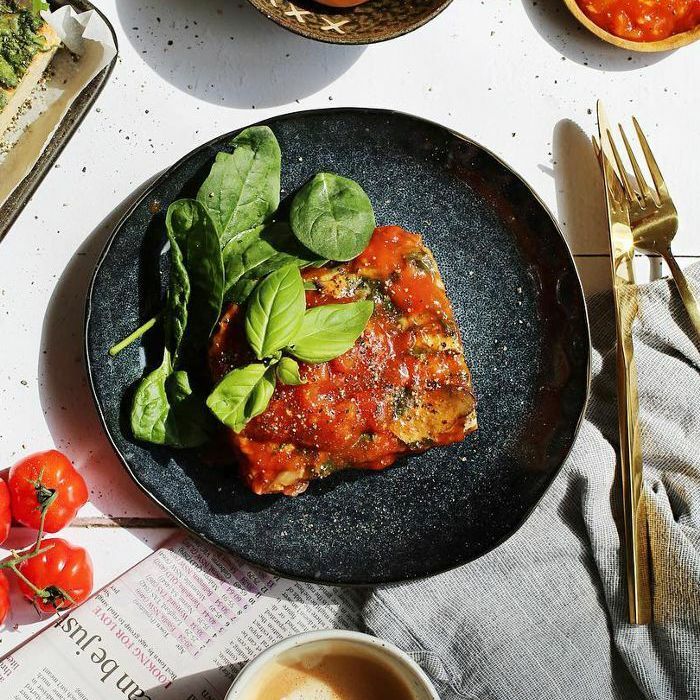 But there's no denying meal delivery services are popping up everywhere, and they're all tailored to suit a range of different eating habits. With convenience being the main selling point, I couldn't deny the fact that I was definitely enticed by the zero-effort factor. Would it be a game-changing? Derail my fitness goals? Blow my grocery budget out of the water long-term? All important questions, and I needed answers. So, to cut through all the services on offer, I put my stomach to the ultimate test and tried seven of Australia's most popular meal delivery options, then broke them down below. So whether you're on a budget or health kick, or just really hate doing the groceries, keep reading to find the plan that's best for you. Marley Spoon's Dinner Party Box was a great entertaining option after I'd had a long week at work, and tackling the grocery store felt like too much of a mission. Providing all the ingredients I needed for mains and dessert, it ended up being really fun to learn a new recipe and was actually a great team activity for easy home-entertaining, plus you can order one without subscribing. You can also subscribe for regular delivery from Marley Spoon and choose from 12 recipes each week. I found there were quite a few good healthy options too. Best for events or dinner parties. I actually ended up trying Hello Fresh because one of my friends offered me a free box discount offer (thank you!). Probably the most well-known, Hello Fresh is essentially your recipe planning and grocery shopping done for you via a subscription where a box lands on your doorstep at regular intervals. What's great about this service is that you can choose meals and portions (for example, three days worth of meals for two people), and it automatically deducts from your bank account, unless you cancel. You can choose from a bunch of recipes, and everything besides presumed staples (think butter, oil, salt) will be included. I found the recipes mostly quite simple and tasty, but with large portions that were high in calories. What I did was split a two-person serve into three, thus lowering the calories to something closer to what I'm used to (plus, better value). At around $11 a portion for both meat and vegetarian options, the pricing is pretty reasonable when you factor in convenience. They also offer a lot of great discount deals. I will note though, if I went to the grocery store and bought everything myself, it would definitely be cheaper. Best for those who love to cook, but hate grocery shopping and recipe planning. Let me just start by saying that Thr1ve was a game-changer. All the meals come pre-prepared, so literally the only thing to do is choose and heat. I opted for the low carb box, and the meals were delicious, varied, clean, and satisfying without being too much. You can even get snacks and breakfast, making it a top pick for anyone who's time-poor, but wants to eat clean. There's a range of meal plans to choose from, and if you opt for three meals a day, five days a week, it works out to $10 a pop, which is pretty great considering convenience and quality. You can even add an allergy filter, so if you're gluten-free, or don't do dairy, you can opt to only add meals that suit your requirements. If you want a foolproof, tasty, healthy eating plan that requires zero effort, this is it. You can actually pick them up in grocery stores too, but the delivery service works out better economically. Also, the beef cheeks and cauliflower rice were probably one of the most tender cuts of meat I've ever had! Best for those who are health conscious, but time-poor. My first impression of my Dinnerly box when I cracked it open was the sheer volume of food inside. The meals were tasty and filling, and were nutritious and made with high quality produce. The only tweak I made was swapping out pasta for zucchini noodles after a particularly indulgent weekend. Like Hello Fresh, it's a subscription model that allows you to sub in and out recipes based on preference, and the recipe cards come via email (less paper waste, which is so great). You can actually feed a family of four for three nights for $69 (making each portion less than $6). This makes it a super affordable and convenient option. It's actually the cheapest of the list, FYI. Best for families, and budget conscious. Youfoodz is another great, pre-prepared delivery service that can be tweaked to suit your eating habits and lifestyle. I went for options like the Clean and Lean Turkey Bowl, and Clean Chicken and Broccoli (part of the Clean Eating plan), but there's also pizza and pasta, should your heart desire. While the calories are controlled, I found some left me slightly peckish, which says more about my portion control than the serving size (which was a great lesson for me in eating less, actually). Breakfast, lunch, dinner and snacks are on offer, and the meals are pretty reasonably priced at $10 each. I was also very impressed with the free pressed juice and spaghetti bolognese that came with my order (it's the little things). Best for time poor, and/or health conscious, and anyone who loves variety. I trialled Eat Fit Food during a really busy week earlier this year where I knew I’d have zero time to cook or prepare my meals in advance. I’d never tried a meal delivery service before (aside from a juice cleanse, which really isn’t the same) so wasn’t sure what to expect. I was pleasantly surprised by just how delicious and filling each of the meals was, and I actually had trouble finishing the dinner portion each night. I really struggle to plan out a full week of meals for breakfast, lunch, and dinner—my schedule is always changing and it’s hard to predict where I will be at any given time due to work commitments. If I know I have a crazy week, I’d absolutely sign myself up. But aside from the convenience, I also noticed another little bonus on the scales. After five-days of pre-planned vegan meals, my jeans were sitting a little looser, and the number on the scale was closer to what I wanted to see. While it might not be sustainable to indulge in this service every day (Eat Fit Food is the more expensive, at around $15 to $20 a meal), it’s definitely something I’d commit to for a few days each month as a bit of a ‘health reset’. Best for anyone looking for a health kick or reset. So, the answer to the question is yes, a meal delivery service can 100 percent streamline your life. I suddenly had reclaimed my Sunday afternoons and Wednesday nights back, all without eating a single can of tuna for a week. While some are pricey (and it's probably cheaper in most cases to duck to Woolies and buy chicken breast and greens) if you have the disposable income, and it's something that makes your life easier, I would definitively recommend opting for one of the above. What's more, it can be a great way to keep health goals in check!